For more than a year, the School Board has been working on a bond proposal that would update existing schools and construct new classrooms to address current and future needs. Their goal is to send a proposal to voters in the May 16, 2017 election. 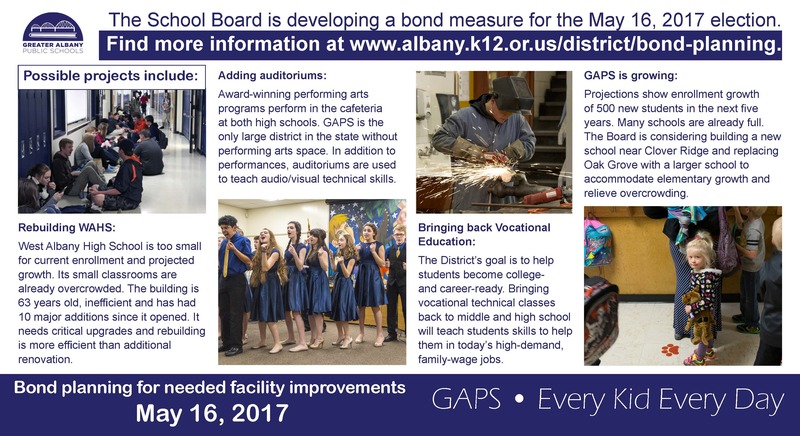 The process has included a comprehensive review of facilities by the community-based District Facilities Advisory Committee (DFAC), which resulted in a recommendation to the School Board. They also hosted a series of community forums in October to gather input from community members. Before finalizing a proposal, they will commission a survey of voters to gauge support for potential projects. The School Board’s plan will balance costs to voters with the growing need to upgrade existing, aging schools. Most of the District’s schools were built to keep up with growth after World War II. Seventeen schools were built between 1948 and 1977. Those buildings need critical improvements to protect the community’s investment in the facilities and to upgrade the learning environment to meet today’s educational standards. Only two schools – Timber Ridge and Albany Options – were built to meet modern educational standards. They are the only two GAPS schools built after the invention of the internet. The list of potential bond projects would make critical improvements to schools, allowing the District to maintain its investments in the facilities, and construct new space to accommodate high projected enrollment growth and address educational deficiencies. More details will be available when the Board develops a proposal in January. 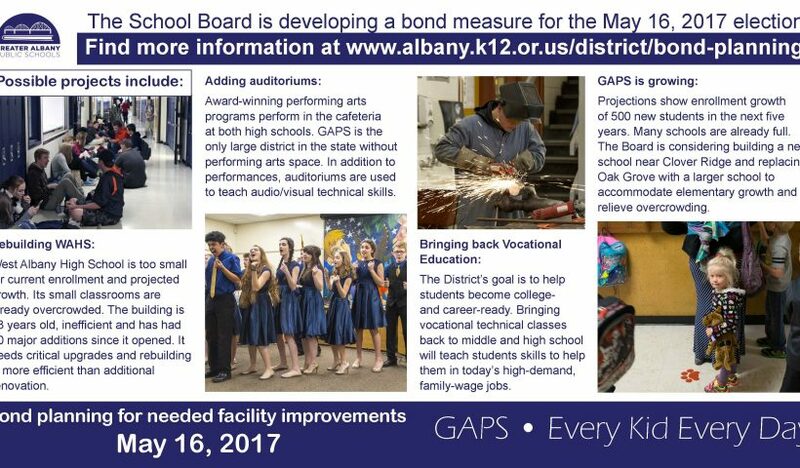 Find more information about the bond planning process and potential facilities projects.